Loss of Normal Cervical Lordosis – What Can Neck Exercise Do To Help? >> Loss of Normal Cervical Lordosis – What Can Neck Exercise Do To Help? Very often people who have neck pain and ask what kind of exercises they can do to help their condition. 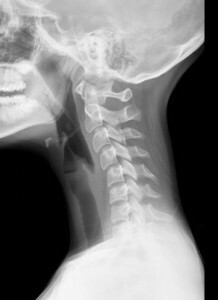 A normal neck should a nice cervical lordosis; it should have a nice C-shaped curve when an x-ray is viewed from the side. Unfortunately it is quite common that people walk around with a total loss of normal neck curve and many of them even have reversed their curve to bend the other way. This can happen from years of bad posture when you are studying as young, work in front of laptops or from car accidents. If you view the first image you can see an x-ray from a teenage girls showing a reversed cervical lordosis and forward head posture. This kind of alignment in the neck causes a dramatic increase of load an the neck affecting muscles and discs alike. The stress in this cases can be easily 2 to 3 times as high as normal load. Compare that an average head weights 10 pounds, that’s the weight of a bowling ball. Now imagine that you are two more of then on top of your head. can you feel the strain on your neck? What neck exercise can help to correct this? It is important to correct forward head posture like this as soon as possible to prevent cervical spondylosis from developing. As a chiropractor specialised in spinal corrective care we have effective neck exercise that help use in restore normal spinal alignment. These exercises apply stress to the neck forcing it to react and hold the neck in a better alignment. They can be given after accurate measurements are made on x-rays showing us how it is aligned and moves. The second x-ray was taken during a weighted exercise less than an hour after the first x-ray was taken and confirmed to us that the given exercise was the right one for this client. This kind of evaluation is something that I do regularly with my clients having problems with their neck.